Get more out of your closing slide in your business presentations. Use the Thank You page to start a relationship instead of just ending a presentation. Does your ‘Thank you slide’ look like this? 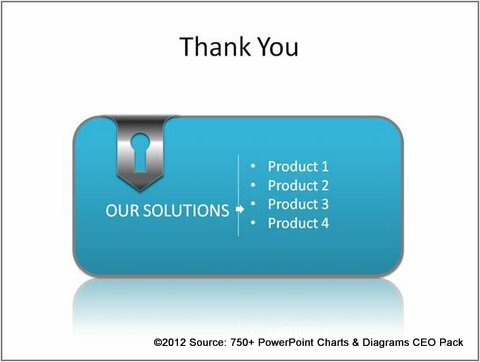 Usually, business presenters don’t give too much thought to their ‘Thank you’ slides. 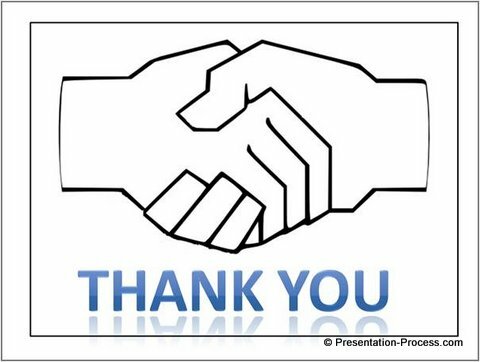 In fact, most closing slides have nothing more than a clichéd picture of a handshake and ‘Thank you’ written in some fancy WordArt. Usually, these slides stay on screen throughout the Question and Answer session, and bore the audience. A simple way to remain in your audience’s mind long after the presentation is finished, is to create a replica of your business card on the screen. When you share your business card with your audience at the end of the presentation, you reinforce the connection even more. Your audience would know how to contact you and take the discussion forward. The slide gives one line benefit of the products that were discussed during the presentation. This usually helps your audience to remember your message far better than a plain ‘Thank you’. There are so many instances where the presenter had made a strong case during the presentation and forgot to include the next steps or just breezed through the slide before the audience could register the message. 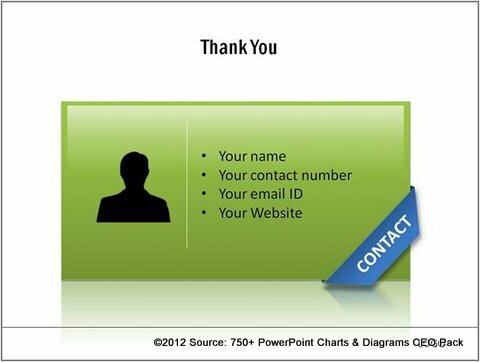 So, it is a good idea to have the ‘Next steps’ or ‘How to order’ slide as your last slide instead of a boring ‘Thank you’. If your presentation was strong, this slide usually triggers a lot of useful questions that help you close the deal. If you had a long presentation, it is a good idea to bring back the agenda slide as your last slide. The slide shows the topics that were covered during the presentation and hence provides an opportunity for your audience to clear their doubts on the points covered. You can follow this up by distributing a one pager on the salient points covered during your presentation. If it is a corporate presentation, where you represent your company – your Thank You slide can just be a big logo of your organization, with your contact details alongside. Usually in these cases, your details are in a font smaller than your company’s logo. Every slide you use in your presentation deck has its own significance. 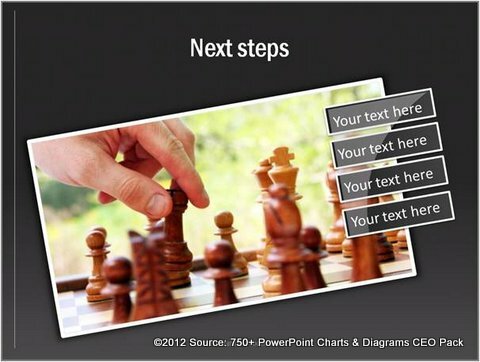 Using the right slide can improve the effectiveness of your presentation significantly. You may not have the time to browse through various sites to learn all the best practices in making effective business presentations. That is why we made this site as your one point resource. Here, you will find hundreds of original articles to help you become a better presenter. You can purchase truly useful products that help you make professional presentations fast. 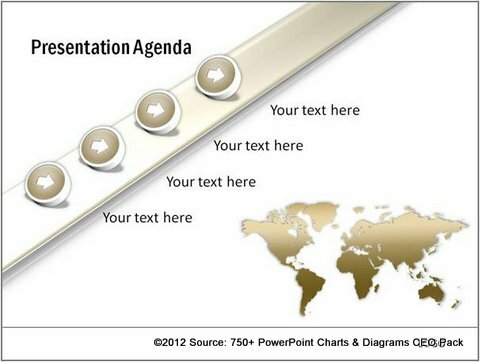 For example, we recommend you take a look at our ‘750+ PowerPoint Charts and Diagram Templates collection for CEOs’. The pack has more than 750 fully editable diagram templates that make the process of slide creation super easy. If you find our site and products useful please recommend the site to your friends and colleagues. We need your encouragement to serve you better.